If I need to make brownies in a hurry, my go to recipe these days is for chocolate fudge brownies from Charlotte Pike’s wonderful book Easy Baking in The Hungry Student series. I first made these for an event last summer where they proved to be extremely popular. Then, last week, I made some for my birthday party. This week, I’ve omitted the coffee, used some different sugars and added blackcurrants. I also always use wholemeal flour or wholemeal spelt which I feel gives me a few brownie points (haha). The method I use is my favourite one pot wonder. On Saturday, a friend kindly let me loose in her overflowing fruit cage and I picked four pounds of blackcurrants. I wasn’t entirely sure what I was going to do with them, but yesterday I used two pounds to make eight pots of glorious blackcurrant and chilli jam. That left two pounds, most of which has gone into making cassis, but I felt a bit of baking was called for too. Hunting around on Eat Your Books delivered blackcurrant beach brownies from Dom over at Belleau Kitchen. I was no stranger to these brownies as they had featured in the blackcurrant round-up of We Should Cocoa a couple of years ago. The concept was appealing and I’d always meant to make some, but they had somehow slipped my mind. Yesterday seemed like a good time to try them out, especially as they will fit in very nicely with a future project I’m planning. Some blackcurrant sauce was called for too – for said future project. The jam recipe came from the queen of preserves Vivien Lloyd via Katie over at Feeding Boys and a Firefighter. It was Sue over at A Little Bit of Heaven on a Plate that suggested it and what a brilliant suggestion it was. Rather than add the chilli to a muslin bag and pull it out at a later date, I decided to add the chillies directly. We grow rocotos which are fleshy and quite hot; they work well in this sort of concoction. We keep a load of them in the freezer, halved and already deseeded. I chopped four halves finely and added them in at the simmering stage. The heat is just right for us. There is a definite kick, but steam doesn’t come screaming out of your ears. The brownies are a little more delicate than the normal ones, with a finer texture. They are utterly delicious, with the tart berries giving bursts of flavour and somewhat offsetting the sugar high. They will do very nicely for what I am planning. If you’re looking for other blackcurrant ideas, you will find plenty here. Sweet fudgy brownies permeated by tart flavoursome blackcurrants. Simple to make and easy to eat. Melt butter and chocolate in a large pan over a gentle heat. Take off the heat and stir in the sugar until well mixed. Sift in the flour, cocoa and baking powder and stir until just combined. Gently stir in the blackcurrants. Pour into a 9″ sq. silicone mould or lined cake tin and bake at 180℃ for 20 minutes when there should no longer be a wobble, but the batter is still fudgy. Remove from the oven and allow to cool in the pan. Cut into 16 squares. I am adding few of these to the Tea Time Treats table where the theme this month is traybakes. Hosted by Jane at The Hedge Combers this month and alternately by Karen at Lavender and Lovage. Look forward to finding out what you do with your blackcurrants Jane – they are a rather wonderful fruit. Thanks Kiarna. Blackcurrant jam is a good one to start with as it’s one of the easiest. Omg those brownies look amazing! I will definitely give them a try with brownies being my favourite! nice to know I popped up for you there!… I remember these brownies being exceptionally good and very dangerously darkly sweet and heavenly!… yours look so amazing. Thanks so much for the mention and thanks for the slice that i assume is winging its way over to me? Ooh, blackcurrant browniies sounds like and excellent idea. Sadly I somehow managed to loose my blackcurrant bush a few years back – I must get a new one! Thanks Heather. Blackcurrants are the sort of fruit well worth growing oneself as they are so hard to find otherwise. Oh how lovely to hear from you Rachel. I’ve been really bad at visiting my favourite blogs in the last few months but do miss you all. I need to find time to do it. Having a lovely summer thank you – busy but productive. Hope you are too. Oh, just seen your new website Rachel – wow. Now there’s a development. It looks fabulous as do your brownies. Hope it all works out well for you. Fantastic, I could make these with the blackcurrants I picked on Saturday, not enough to make jam but certainly enough for brownies. Oh yes, good idea Janice, they are rather good. For a slightly less sugary treat, you could always try Blackcurrant Buckle. These look delicious. There is always time for chocolate brownies and they look extra scrummy with the black currants added. Thank you Laura. I’m a bit of a brownie fan and always think the latest batch I’ve made is the best ever – well nearly always! Gorgeous! 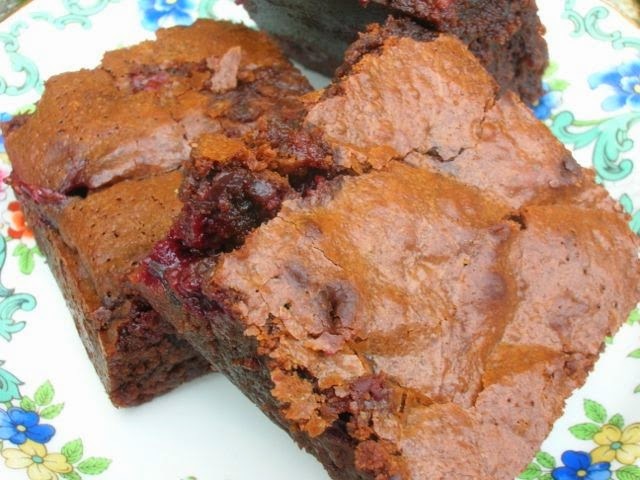 I have never heard of blackcurrant brownies but they sound a-ma-zing! Lovely 🙂 I just used up the last of my frozen blackcurrants from last year (they are literally still on the hob bubbling away with some freshly scavenged wild raspberries on their way to being jam!) but when I pick this years I know just what to bake first. Oh well Scottish blackcurrants are meant to be the best Kellie, so I’m sure your jam and brownies will be super fabulous. Blackcurrant and raspberry jam sounds rather delicious too. 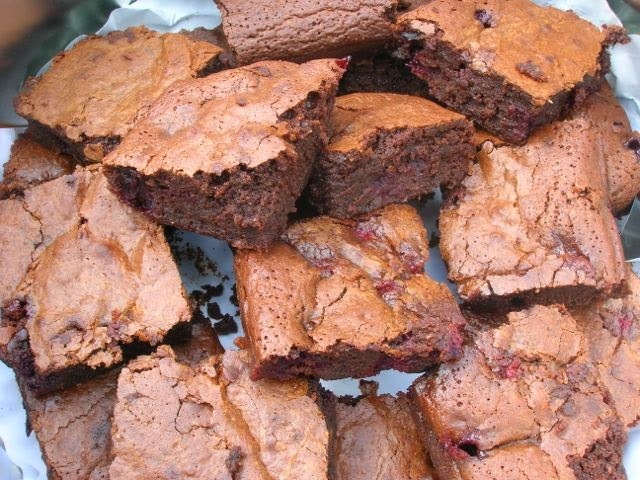 Blackcurrant brownies – sounds delicious. Cornwall, what a place to live! Thanks Kimberly, I am indeed very lucky to live in Cornwall – it’s my home and I love it. Blackcurrant and chocolate is a wonderful combination and these brownies sounds wonderful. Blackcurrant and chilli jam sounds amazing too……… I must consider getting a blackcurrant bush! Oh do, if you have room, they are so worth it – try for 2 or 3 if you can Kate. I’ve not tried fresh cherries in brownies before Fiona and am now raring to try them. How difficult is into make jam? I have always wanted to try it! Hi Holly – jam making can be very easy and also quite tricky. It all depends what sort of jam you want to make. Blackcurrant jam has a high pectin content and is thus a very easy jam to make and set. Strawberries have little pectin so the jam is more difficult. I’m so jealous of your fruit haul! What a brilliant idea to use them in brownies, a great twist on the classic cherry choc combo. I bet they tastes divine. Love the little streaks of purple I can see. That jam looks amazing too. So so jealous! Yes, I felt very luck to have this opportunity Katie. I usually manage a small punnet from my mother’s blackcurrants, but the birds got them all this year. But I’ve not had a big haul like this ever. Oh yes, these hit the spot Choclette and look at that glorious colour! Thanks Vohn. Blackcurrants do work well for this very reason. Wow! Blackcurrants and duck eggs! Tell me, do duck eggs have a different flavor from chicken eggs? Is it noticeable in the brownies? Duck eggs are not available around here, so I’m very curious.